Kevin Durant and Klay Thompson handed San Antonio a painful shooting lesson as Golden State took a grip on their Western Conference playoff duel on Monday. Dwyane Wade of the Miami Heat shoots the ball against the Philadelphia 76ers in Game 2 of the NBA Eastern Conference first-round playoffs in Philadelphia, Pennsylvania, on Monday. The Heat won 113-103. Durant and Thompson both scored 30-plus points as the Warriors powered to a 116-101 win that puts the NBA champions 2-0 up in their best-of-7 series. The Warriors — still missing the injured talisman Stephen Curry — outclassed a physical San Antonio from 3-point range in a devastating display of scoring. Golden State made 15 of 31 attempts from 3-point range, contrasting sharply with San Antonio, which could only muster 4 from 28 attempts. Spurs coach Gregg Popovich pinpointed his team’s failure to threaten from distance as the principal factor in the loss. San Antonio started strongly, with LaMarcus Aldridge — who finished with 34 points — driving the Spurs forward as they shaded the first period 25-23. But Golden State’s relentless pressure and offensive variety inevitably began to tell in the second half. Durant finished with 32 points, 6 rebounds and 6 assists while Thompson had 31 points with 5 assists. The Warriors now head to San Antonio for Game 3 tomorrow. 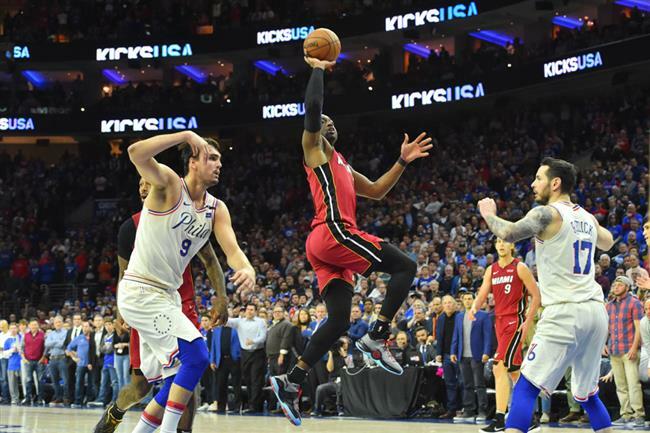 In the East, Dwyane Wade produced a vintage performance as the Miami Heat ended Philadelphia’s 17-game winning streak to level their series 1-1. Wade, 36, scored 28 points in 25 minutes as Miami stunned the 76ers’ home crowd into silence with a 113-103 victory. It was a superb display from Wade, a three-time NBA champion who started this season with Cleveland before re-joining Miami in February. Wade’s experience proved crucial throughout, inspiring a first-half fightback to wipe out the 76ers’ early lead before shepherding Miami to the win in a nervy finale in Philadelphia. Wade, who also had 7 rebounds and 3 assists, was backed by 20 points from Goran Dragic and 18 from James Johnson. Philadelphia meanwhile was left reflecting on its first loss since early March, jolting its momentum as the series heads to Miami for Game 3 tomorrow.